Japan-based object storage startup Cloudian has marched into the scale-up and scale-out storage space in a big way with Samurai – its internal name for NFS/S3-accessed HyperStore software running on seriously chunky hardware building blocks. HyperStore is a distributed object storage technology, with an on-premises element as well as an Amazon S3 back-end. Data is stored in buckets in virtual or vNodes and there are several vNodes per physical node with nodes being connected in a Scality-like ring that can span data centres. Objects are split into sections and stored across vNodes for protection and durability. The existing scale-out HS1000 and HSA2000 appliances each have 12 x 3.5-inch disk drives. The HS1000 is a 1U system powered by an 8-core Atom C2750 CPU, using 2TB, 4TB or 5TB drives. 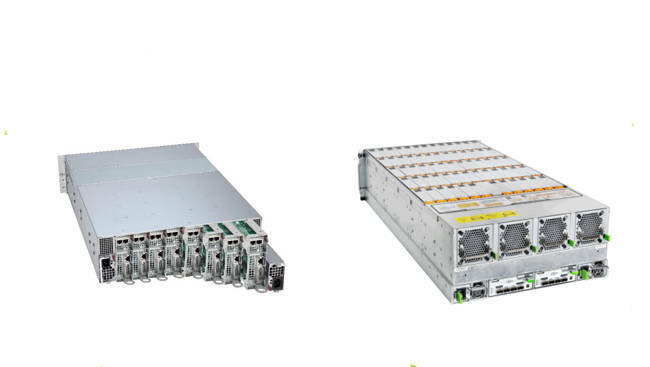 Its larger and flash-optimised HS2000 sibling runs on an 8-core Xeon E5-2600 v2 processor in a 2U box. It uses the same disk drives but has 2 x 300GB SSDs as well, making it a much more powerful system. In a substantial change, these two now have an FL3000 big brother fitted with up to eight μNodes, physical Supermicro micro-servers and scaling up to 1.92PB. This FL3000 is both a scale-up and a scale-out system. Its composed of a 3U server chassis holding the 8 x μNodes with 2 x 480GB MLC SSDs per μNode, and a 4U disk expansion shelf holding 60 disk drives. These are 2, 4, 6 or 8TB SATA 7,200rpm disks. There is one disk zone per μNode and 2 or 4 zones per shelf. The SSDs are used by the HyperStore OS and for Cassandra (metadata store). There are 3 zones to keep the CPU:disk ratio at an optimum level. There are 10TB shingled* drives coming and that (300TB zones) is about the right limit for a single node server right now. Each μNode runs on an 8-core Xeon E5-2640 v2 CPU, making each base FL3000 equivalent, roughly speaking, to eight HSA2060s (8 x 8 cores and 8 x 60TB capacity). There are two types of μNode; the FL3020, with 64GB of memory, supporting up to 15 data disks and the FL3050 with its 128GB of DRAM supporting 30 of them. Taken literally, each FL3000 micro-server chassis can have between three – the minimum – and eight micro-servers and up to four disk expansion shelves (up to 1.92PB). A rack can hold two fully scaled-up FL3000s (3.84PB) and you can have up to 100 racks (384PB), which is serious scalability by anyone’s standards. Cloudian says it’s tested a ring of 200 nodes successfully. Every system component is hot swappable, and Cloudian says there is no system downtime in the event of a node failure. Cloudian says that you can replace or add newer tech servers and storage in the future, because of the modular design, and so avoid forklift-style upgrades. You also avoid data migrations as the system self-load-balances. When you replace server blades, the metadata in the SSDs stays in place for the new CPU board.